But there were some of his acquaintances, with whom he associated without any assumed appearances. One of his friends had a female domestic, who, having been debauched and become pregnant by some person, when she was urged by her owners to name the individual, said that Symeon had secretly cohabited with her and that she was pregnant by him; that she was ready to swear to the truth of this statement, and, if necessary, to convict him. 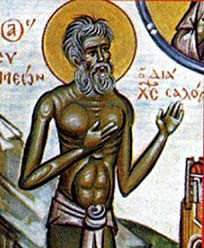 On hearing this, Symeon assented, saying that he bore the flesh with its frailties; and when the story was universally spread, and Symeon, as it seemed, was deeply disgraced, he withdrew into retirement, as if from feelings of shame. When the woman's time had arrived, and she had been placed in the usual position, her throes, causing great and intolerable sufferings, brought her into imminent peril, but the birth made no progress. When, accordingly, they besought Symeon, who had come there by design, to pray for her, he openly declared that the woman would not be delivered before she had said who was the father of the child. And when she had done this, and named the real father, the delivery was instantaneous, as though by the midwifery of truth. He once was seen to enter the chamber of a courtesan, and having closed the door, he remained alone with her a considerable time; and when, again opening it, he went away looking round on all sides lest any one should see him, suspicion rose to so high a pitch, that those who witnessed it, brought out the woman, and inquired what was the nature of Symeon's visit to her and continuance with her for so long a time. She swore that, from want of necessaries, she had tasted nothing but water for three days past, and that Symeon had brought her victuals and a vessel of wine; that, having closed the door, he set a table before her and bid her make a meal, and satisfy her hunger, after her sufferings from want of food. She then produced the remains of what had been set before her. Also at the approach of the earthquake which visited Phoenicia Maritima, and by which Berytus, Byblus, and Tripolis especially suffered, raising a whip in his hand, he struck the greater part of the columns in the forum, exclaiming, "Stand still, if there shall be occasion to dance." Inasmuch as none of his actions were unmeaning, those who were present carefully marked which were the columns he passed by without striking them. These were soon afterwards thrown down by the effects of the earthquake. Many other things he also did which require a separate treatise.